As a corrupter of language. Among countless insults and injuries inflicted by 45 upon democratic institutions and values, his use of the English language may not seem to be particularly momentous or urgent. Over time, however, it could have insidious and long-lasting consequences. “But if,” as Orwell wrote, “thought corrupts language, language can also corrupt thought,” which is to say, 45 threatens to corrupt not just the words we speak to each other, but the thoughts that precede and comprise those words. Which thoughts, in turn, further corrupt the language, and so on. This is a positive feedback loop. As an accelerant of said positive feedback loop. 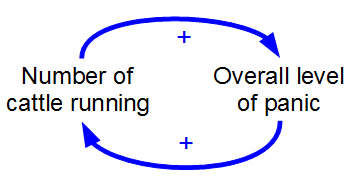 Such loops quickly amplify small changes into large ones, moving a system away from equilibrium, making it more unstable. Whether by deliberation or intuition, 45 adroitly uses this feature of our cognitive machinery against us. The easier it is to recall knowledge, the more weight a decision maker will assign that knowledge in making an assessment. Simple, visceral causes for things—explanations that scare us, and thus stand out as more vivid and memorable—are readily at hand and become more attractive explanations. The Scientific Explanation. Photo courtesy of Ky Olsen. Anything but X, which we can’t seem to easily recall in this moment. So we choose X. And then, after choosing X, we are even more fearful. In the next cycle, X becomes incrementally more attractive, and those who chose it are even more likely to choose it again. The recall and adoption of X as an explanation gets easier, and more attractive, to the point that X becomes literally the only imaginable choice. It feels 100% right, we think, because of everything we’ve heard about X. Except almost all of what we’ve been hearing, from the beginning, is reverb, not signal. Our own echoing voice, amplified and distorted, repeating itself, on top of itself, drowning out all other sound. Droste Effect, 2009. Photo courtesy Nevit Dilmen. This is what 45 does. Setting off feedback loops, each of us feeding back into our own tendencies and predilections and unconscious instincts. He didn’t invent it. This has been decades in the making. But he’s arrived at the perfect moment to capitalize on it. As a practitioner of halfthink. As distinguished from its more sophisticated cousin, doublethink (the holding two mutually contradictory beliefs in the mind at once), halfthink is a cruder yet potentially more effective tool at the disposal of 45. Halfthink can be defined as holding not two beliefs, but half of a belief in the mind. Which, by virtue of its fractional incompleteness, has the useful feature of being impervious to contradiction, argument or rational scrutiny. Practitioners of halfthink enjoy the benefit of being able to fit any number of explanations about the world and reality in a way that is consistent with their halfbeliefs. Expert halfthinkers (and 45 is certainly an expert at it), can even vary which half of an idea they mean from moment to moment, giving even more flexibility and fluidity to their halfthoughts, further strengthening the coherence of their narrative or argument. Thus, adept use by 45 of halfthink (and the closely related halfspeak) allows his audience to customize the version of the message, on a highly personalized basis, the genius here being that it is the listener who does the work of personalization. Millions of intended recipients, in a kind of public key cryptography, each one receiving the message and filling in the rest according to their own halfbeliefs, their own instincts, fears, worries. Each one completing his halfthoughts with their own, like a lock and key, and feeling that 45 is speaking to them directly. Flocking, an example of collective animal behavior. Photo courtesy John Holmes. As a destroyer of common knowledge. Common knowledge, in the game theory context, is a specialized state of affairs: there is common knowledge of a fact F in a group G when every person in G knows F, and they all know that they know F, they all know that they all know it, and so on, ad infinitum. Another way of looking at common knowledge might be: as a basis for something called consensus reality. 45 breaks down common knowledge. 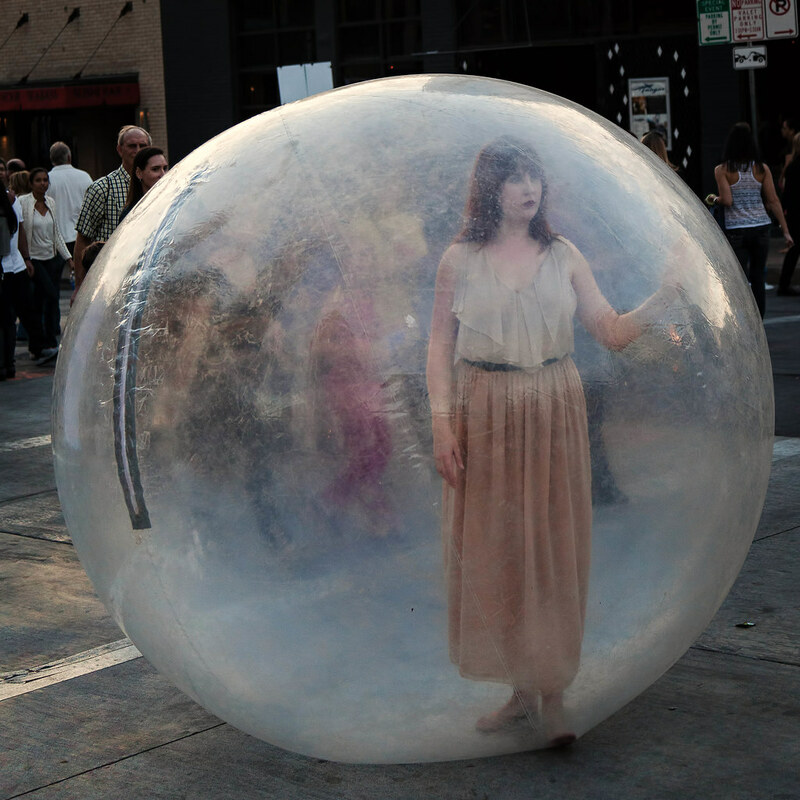 The large macro-bubble becomes millions of tiny, single-occupancy microbubbles. Consensus reality becomes personalized, person-sized echo chambers. From The People From The Consensus Reality. Courtesy Marlio da Silva. As the embodiment of a personalization algorithm. Through his ad hominem attacks and his use purported use of Big Data, 45 practices two types of personalization: political and algorithmic. 45 is not a broadcaster, but its perfected opposite. A narrowcaster, streaming to a hundred million individual hearts and minds at once. As someone not to be looked at, but as himself a lens. A way of looking. W.E. Hill, Ma femme et ma belle-mère, 1915. As a developer and builder, now making claims on a new landscape: our mental real estate. As a producer of reality. Not reality TV. Reality. Or, to be more precise, millions of micro-realities, unfettered by the inconvenience of consensus reality. A micro-reality. Isolation, 2009. Photo courtesy David Ingram. Freed of these constraints, 45 has an inherent advantage. In the legal system, a defendant who is financially insolvent is sometimes referred to as “judgment-proof.” By lacking assets, judgment-proof defendants possess a form of invulnerability. 45, by virtue of his halfthink, is a judgment-proof defendant, an end-game player. Someone unconcerned with the stability of the game going forward. As a world builder, a genre writer. A storyteller. 45 didn’t start it, but he finished it: the use of doublethink and halfthink to damage the integrity of the world of the narrative, cleaving of two half-worlds from one. He’s the president of one half-world, and in the other, the anti-President. Nightly news airs in each half, telling mirror-image stories. Why does 45 always say the craziest thing? The thing that seems so obviously self-damaging? Is it a lack of control, desperation, an inability to adjust his strategy? His goal is to minimize disturbance to the story. He does this not merely by denying the external attacks on the coherence of his story, but in re-doubled assertions. Blocking out noises from the outside world by shouting over them. There’s a perverse genius in this. To see this, imagine someone who believes in 45, yet listens to sources of news and information that have caused some doubt to creep in about 45’s narrative. If 45 engages with such outside sources, the two narratives now have a tangent point—one can reference the other. They are in the same universe. But by precluding even the mere existence of the other narrative, he can frame the choice as between two obviously incompatible versions of reality. Someone who might otherwise allow doubt to creep in, who suspects that there may be something fishy going on with the version they’ve been living in, must choose, between X and not X. 45 forces the choice. What appears to be a weakness is actually a form of message discipline. 45 doesn’t gain anything by acknowledging the disconnect between the two half-worlds. In fact, it’s the opposite. By staying on-message, even as the message detaches from consensus reality, 45 reinforces the coherence of his worldview. A self-consistent, impossible reality. M.C. 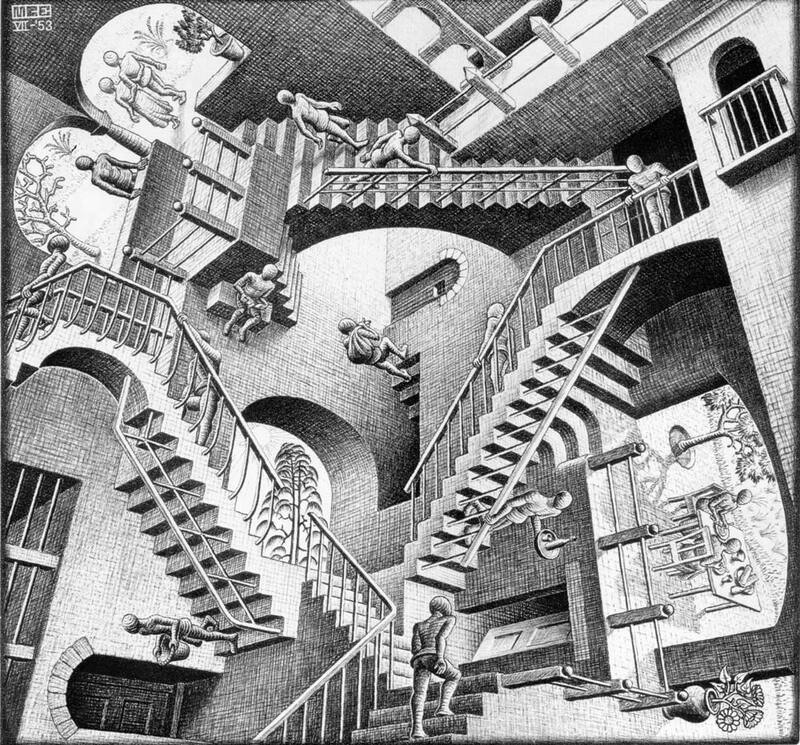 Escher, Relativity, 1953, lithograph. His small, closed reality has built into it the very weakness which can be used to undermine it. It’s over-designed, sealed off. Given enough time, its own contradictions become evident. It doesn’t make sense, even on its own terms. As requiring a new way of looking. Taking a step backward, and outward, reframing from a new vantage point. 45 is unthinking, and thinking is what can be used to break his loop. Thinking, analogy, new ways of looking. Using creativity and imagination to resist it, to resist the centrifugal force of normalization created by the loop. As someone whose strategy is currently highly effective, yet even in its success, carries the seed of its own undoing: a lack of curiosity. Humans are explorers. We wander, we seek. We believe things about the world. We go out into the world to collect more bits of information to bring back, building and discarding. Forming ideas and then checking them. The interplay between the two. Learning how to see what we can’t see. Constantly trying to imagine what’s not there. Curiosity and belief: this is also a positive feedback loop. A virtuous one. 45 lacks imagination—but even worse, he underestimates the imagination of others. Of us. He lacks the ability to imagine how and when his own loop will be disrupted, and thus he will not be able to realize the moment when a new story has begun, when we have broken out of the bubble he has created, into a new mode of looking. It is Un-American to say anything negative about being American. This is the definition of freedom. What is lost when words fail? Language can serve as a preoccupation, and in that sense become a cage.